Whoa, baby! 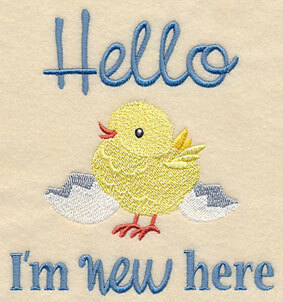 This week's new designs are all about the little ones in your life. 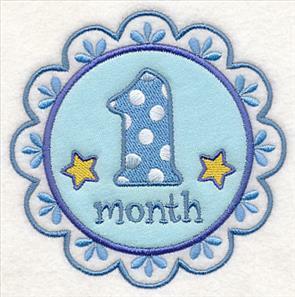 Whether you're embroidering a project for a baby shower or simply doting on your favorite toddler, you'll find loads of inspiration in these sweet designs. A new collection of bib designs will keep your tots squeaky clean, while charming critters and cute sayings are the perfect fit for tees, onesies, and more. 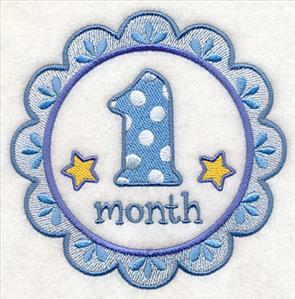 Celebrate monthly milestones with cheerful appliques, and amp up baby gear and nursery decor with adorable designs. 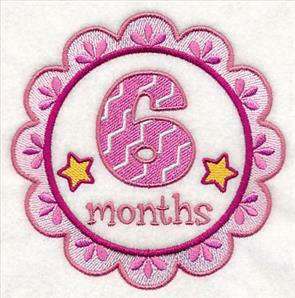 There's also have a special surprise this week: doll face designs! Three different styles of boy face designs await (and each style comes in four variations!). 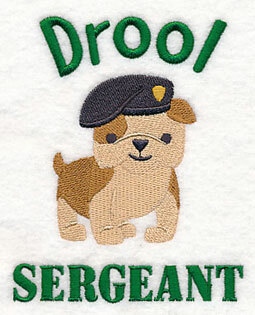 Choose your favorites and add to soft rag dolls and doll patterns. 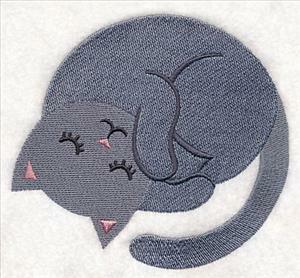 Give a hoodie new life with an embroidered friend peeking out of your pocket! These sleepy critters are a charming addition to baby blankets, quilts, onesies, and more. 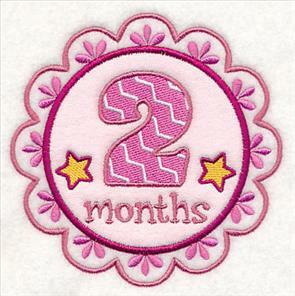 Each design comes in two options -- stitch-filled and applique -- and are sure to be a hit. 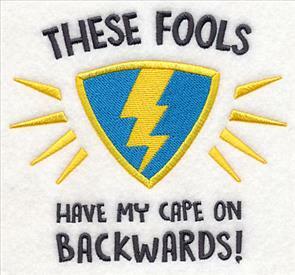 The stitch-filled versions are on the left; the appliques on the right. 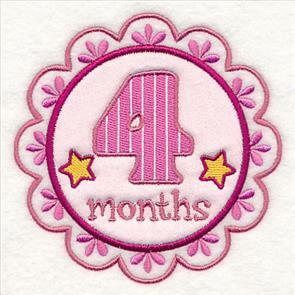 Get more information on stitching applique designs here. 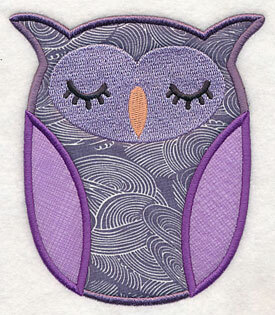 6.11" x 4.87" and 3.90" x 3.10"
A whimsical owl is a hoot when added to your nursery gear. 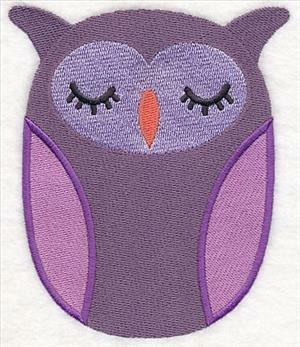 We love the idea of having your little one nap alongside this little sleepyhead. 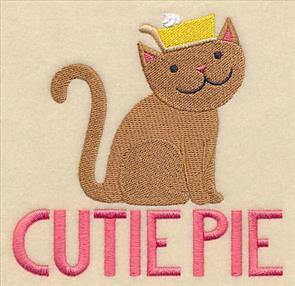 4.86" x 5.61" and 3.38" x 3.89"
A sweet kitty curled into a ball is a cozy addition to any nursery. 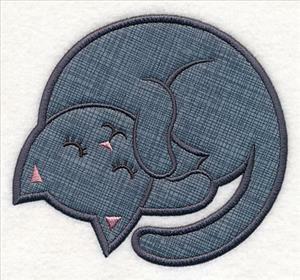 Stitch this furry friend on blankets, pillows, wall hangings, and more. 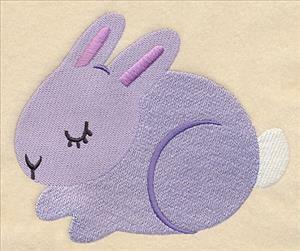 5.31" x 4.86" and 3.90" x 3.57"
Pair your sleeping critters together to create a collection of wall hangings, or stitch onto quilt blocks for an entire Sweet Dreams-inspired project. 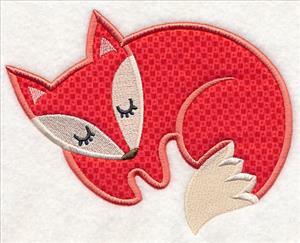 We love mixing and matching the adorable animals! 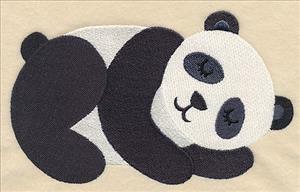 6.80" x 4.79" and 3.89" x 2.77"
A darling panda is a precious option when embellishing tote bags, onesies, and baby blankets. 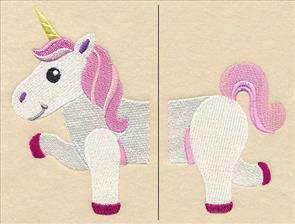 The stitch-filled version is on the left; the multi-piece applique on the right. 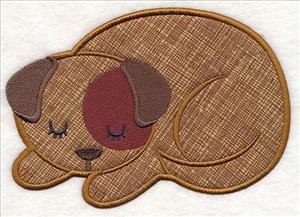 Get more information on working with multi-piece applique designs here. 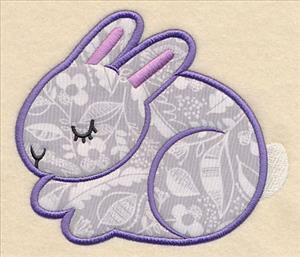 6.88" x 4.21" and 3.89" x 2.38"
Create a cute and creative embroidery project with our delightful fuzzy bunny design. 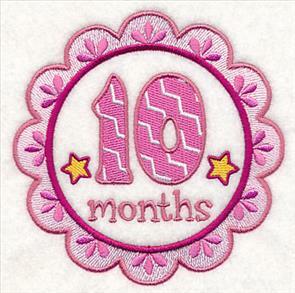 We love how adding fabric to the applique gives it a multi-dimensional look. 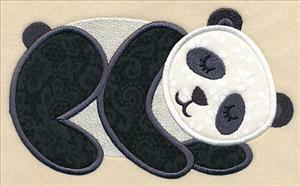 5.67" x 4.86" and 3.88" x 3.35"
Get your little ones ready for naptime with our collection of sleepytime critters. Pick your favorites by using the links above, or get all the designs in a design pack. 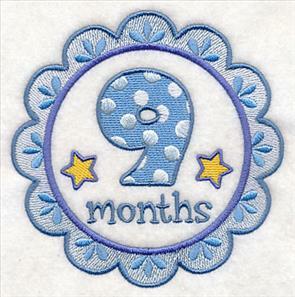 Two versions are shown below: stitch-filled, and applique. 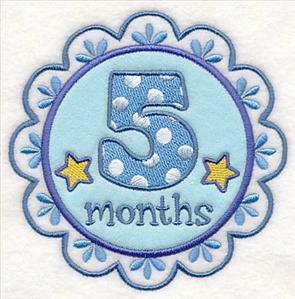 Stitch some love for your little ones with one of our absolutely adorable baby-friendly designs. 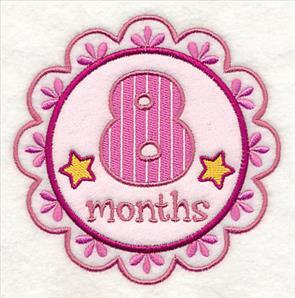 Each of the cute-as-a-button designs are oodles of fun when added to baby bibs, tees, onesies, diaper bags, and more! 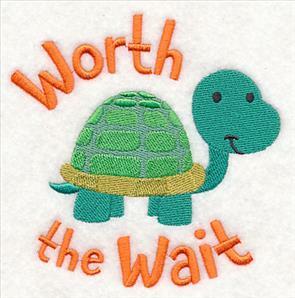 4.72" x 4.86" and 3.75" x 3.87" and 2.91" x 3.00"
There'll be no doubt how much your tiny tot is loved when it's written across the front of their bib, onesie, or t-shirt. 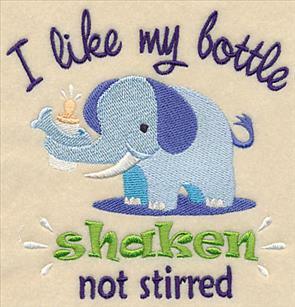 The cheerful characters shown on each design are the perfect complement to the super-sweet sayings. 4.85" x 4.82" and 3.88" x 3.85" and 3.01" x 2.99"
Whether your little love is a certified cutie pie or licensed stud muffin, they'll charm anyone when decked out in these designs. 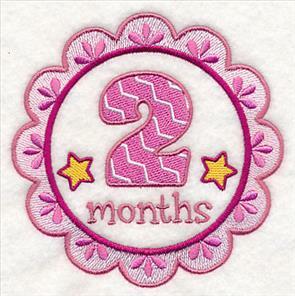 Not only are they fabulous additions to bibs and onesies, but we love adding them to baby blankets, nursery decor, and diaper bags, too. 5.60" x 4.87" and 3.87" x 3.36" and 3.00" x 2.61"
Help the little one in your life sport some sass with these humorous bib designs. You're sure to get a kick out of the clever sayings and creative illustrations. 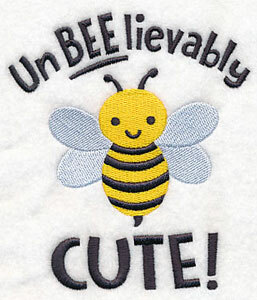 5.38" x 4.86" and 3.83" x 3.47" and 3.00" x 2.71"
These too-cute critters will get loads of giggles when featured on your tot's favorite bib or burp cloth. 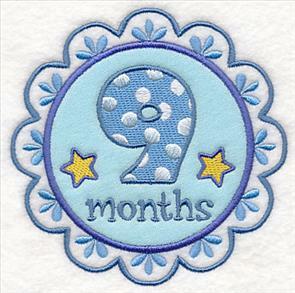 Each of the kid-friendly designs are the perfect option for sprucing up plain-Jane baby linens. 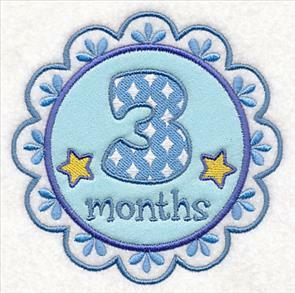 4.17" x 4.86" and 3.31" x 3.86" and 2.57" x 3.00"
Stitch these fun designs on bibs, onesies, or other baby gear to help your little one show who's boss! 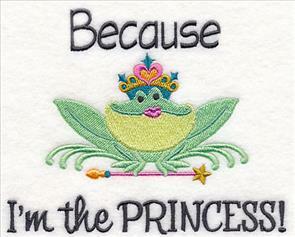 The frog prince has a dignified scepter and crown, while the frog princess's adornments are a little more ornate. 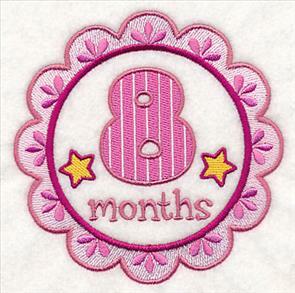 5.94" x 4.86" and 3.86" x 3.16" and 2.99" x 2.45"
Add the embroidered necklaces and tie designs below to bibs, t-shirts, and onesies to help the kiddos in your life add fabulous flair to their everyday wear. t-shirt with one piece of medium-weight cutaway stabilizer, then load the design and align the needle over the center point. 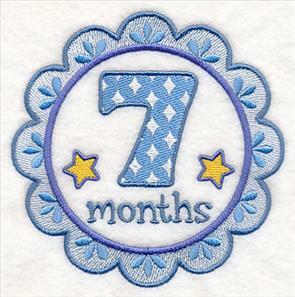 Embroider the design! 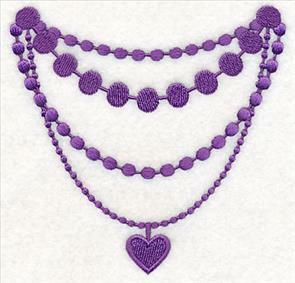 Your little fashionista will be the talk of the town when bedecked in these fab layered necklaces. 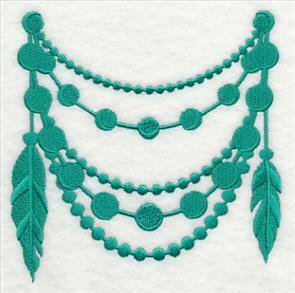 A beautiful flower adds a hint of sweetness to one design; hanging feathers brings extra embellishment to the other. 4.89" x 4.86" and 3.88" x 3.86"
Continue the jewelry theme with a heart-adorned necklace, or give your little guy a dressed up look with an adorable striped tie. 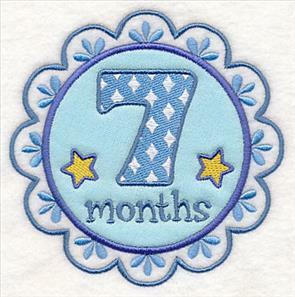 Stitch the precious designs onto bibs, tees, or onesies. 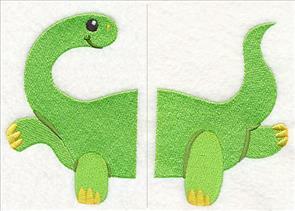 2.04" x 4.98" and 1.58" x 3.85"
Create fun baby shower gifts with these darling designs. 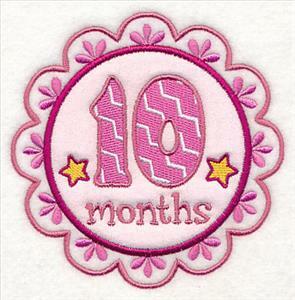 We love giving homemade gifts for a brand new baby, and these designs are the perfect embellishment! 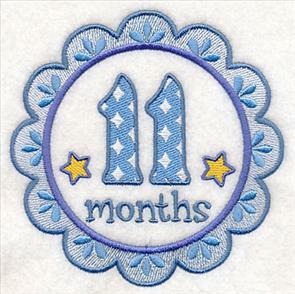 The stitch-filled versions are on the left; the appliques on the right. 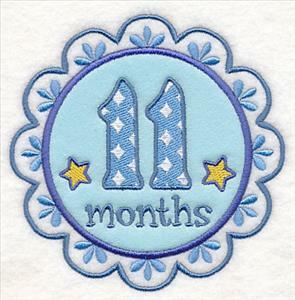 Find step-by-step instructions for applique designs here. 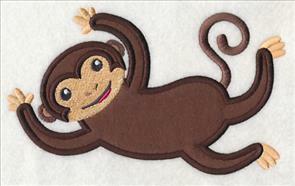 6.59" x 4.89" and 3.90" x 2.90"
Stitch this design onto baby gear or nursery decor for your favorite little monkey! 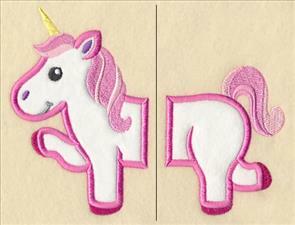 The stitch-filled version is on the left; the multi-piece applique on the right. 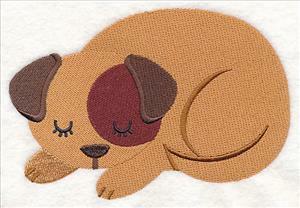 Project instructions for stitching out multi-piece applique can be found right here. 6.85" x 4.10" and 3.89" x 2.51"
A beautiful unicorn is colorful and sweet when added to a wide variety of baby items, including pillows, onesies, and more. 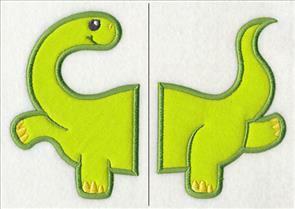 The stitch-filled versions are on the left; the appliques on the right. 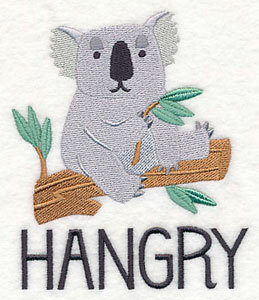 Click here for instructions for applique embroidery. 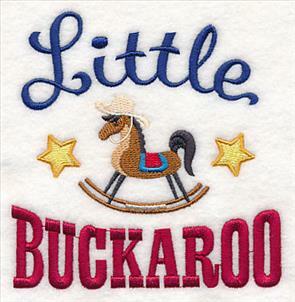 6.03" x 4.85" and 3.88" x 3.11"
Give a playful look to kid-friendly embroidery projects with our lighthearted Peek-a-boo Pals. 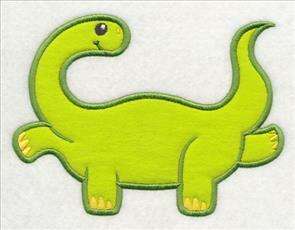 The adorable amigos are a lively addition to a variety of embroidery projects. Kenny whipped up two adorable hooded sweatshirt projects: one featuring a stitched-filled peek-a-boo pal, and the other an applique peek-a-boo pal. 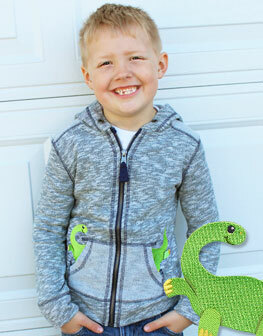 Find his instructions for the stitched-filled hoodie here, and the applique version right here. 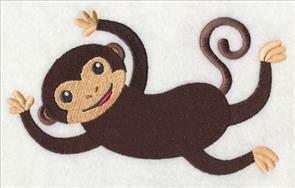 We chose to have them peeking out of sweatshirt pockets, but you can also use them to bookend a monogram, adorn quilt squares, or more -- let your imagination run wild! 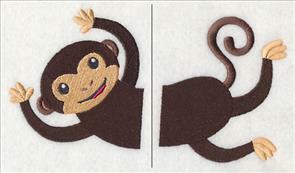 3.32" x 4.87" and 2.67" x 3.90"
A smiling monkey flutters his hands (and feet!) 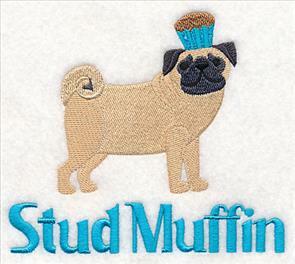 in excitement in this embroidery design. 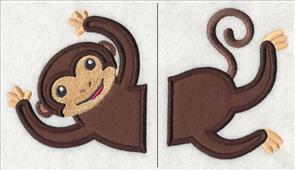 We offer two options of the banana-loving critter: stitch-filled and applique. 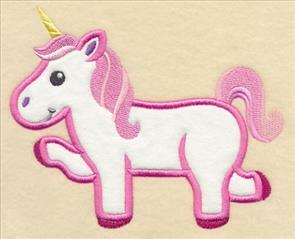 3.71" x 4.05" and 2.97" x 3.24"
A whimsical unicorn gives a short wave and a kind smile. 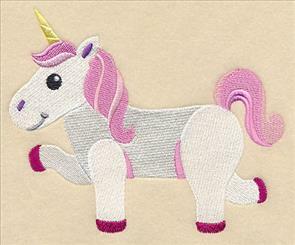 The sweet rendition of the fan-favorite magical creature is a darling addition to your next kids-theme embroidery project. 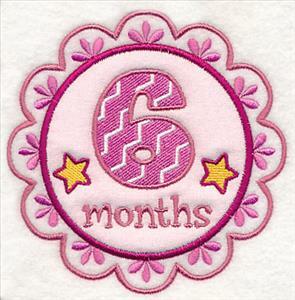 3.25" x 4.85" and 2.62" x 3.86"
Celebrate each of your tiny tot's milestones with our month-by-month medallion designs. 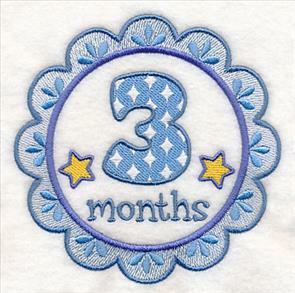 The stitch-filled versions are on the left -- these designs have open space; the white sections are not filled in, so background fabric is visible. 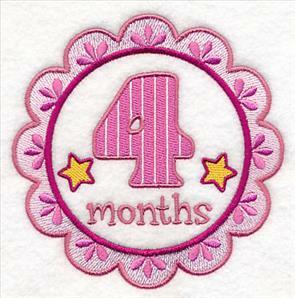 The applique designs are on the right. 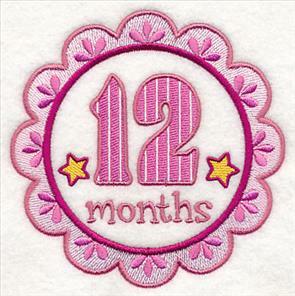 For more information on stitching applique designs, click here. 4.85" x 4.84" and 3.87" x 3.87" and 3.00" x 3.00"
The above designs are also available in packs! 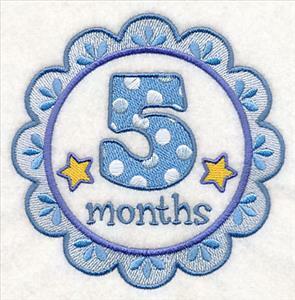 Two versions are shown below: stitch-filled and applique. 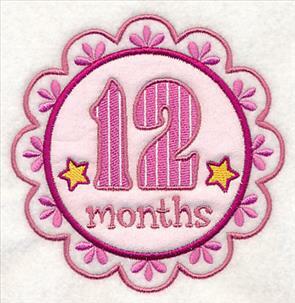 The stitch-filled versions are on the left; the appliques on the right. 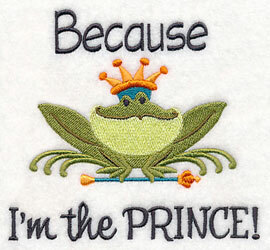 Get more information on working with applique designs right here. Rag dolls make the perfect gift for the kids (and grandkids!) in your life. 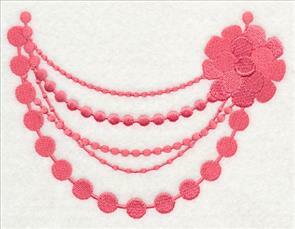 Create a look you love with one of the sweet embroidered boy doll faces below. 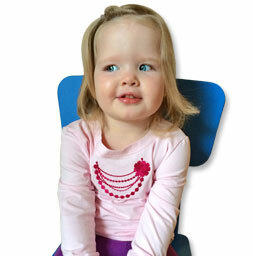 The doll face designs come in three styles, so you're sure to find a face to suit any doll project! There are three adorable boy doll face options to choose from: realistic, cartoony, and primitive. Each set of doll faces also has three facial expressions -- looking forward, winking, and sleeping -- which make it easy to bring your doll to life. 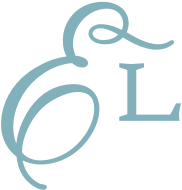 Realistic designs are shown first, followed by cartoon designs, and then primitive designs. Choose your favorite style and expression, then see these project instructions to create your own too-cute soft rag doll. Looking for girl doll faces? Find dozens of designs right here and project instructions for the girl rag doll project here. Big, bright eyes and realistic facial features give these doll face designs an all-natural effect. 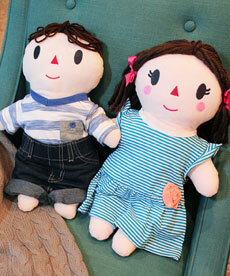 Choose your favorite expression and colors to make a charming doll for your favorite kiddo. 5.87" x 4.18" and 4.85" x 3.45"
5.87" x 4.23" and 4.85" x 3.49"
5.81" x 4.14" and 4.80" x 3.43"
3.86" x 2.76" and 2.50" x 1.79"
5.89" x 4.28" and 4.87" x 3.54"
5.88" x 4.29" and 4.87" x 3.55"
5.86" x 4.26" and 4.87" x 3.54"
3.86" x 2.81" and 2.51" x 1.83"
5.86" x 4.17" and 4.86" x 3.46"
5.86" x 4.16" and 4.86" x 3.44"
3.85" x 2.74" and 2.50" x 1.79"
5.88" x 4.46" and 4.87" x 3.70"
5.88" x 4.40" and 4.87" x 3.65"
3.86" x 2.93" and 2.51" x 1.91"
Large, wide eyes and a cheerful smile are classic cartoon face characteristics and are a fun addition to any doll. We've offered the lively looks in four options, so you can customize the doll for its recipient. 5.81" x 4.15" and 4.80" x 3.43"
5.80" x 4.18" and 4.79" x 3.46"
5.82" x 4.15" and 4.81" x 3.43"
3.85" x 2.75" and 2.49" x 1.79"
5.80" x 4.15" and 4.80" x 3.43"
5.80" x 4.17" and 4.80" x 3.45"
3.84" x 2.75" and 2.49" x 1.79"
5.81" x 4.16" and 4.81" x 3.44"
5.81" x 4.22" and 4.81" x 3.49"
5.82" x 4.21" and 4.81" x 3.48"
Little ones will adore dolls embroidered with sweet Raggedy Andy-inspired faces. 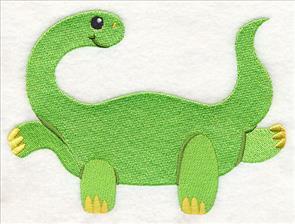 The primitive-style designs will bring loads of smiles -- stitch one onto a rag doll for your favorite tot! 5.20" x 2.61" and 4.31" x 2.17"
5.22" x 2.59" and 4.33" x 2.15"
5.05" x 2.59" and 4.19" x 2.15"
3.32" x 1.70" and 2.17" x 1.11"
4.83" x 2.99" and 4.01" x 2.48"
4.73" x 2.97" and 3.93" x 2.46"
4.59" x 2.23" and 3.81" x 1.85"
3.02" x 1.47" and 1.98" x 0.96"
5.70" x 2.46" and 4.73" x 2.05"
5.62" x 2.36" and 4.67" x 1.96"
5.64" x 2.36" and 4.68" x 1.96"
3.71" x 1.55" and 2.42" x 1.02"
5.22" x 2.61" and 4.33" x 2.16"
5.19" x 2.64" and 4.31" x 2.19"
5.20" x 2.14" and 4.31" x 1.78"
3.42" x 1.41" and 2.24" x 0.92"
Marilyn loved our series of owl sketches, but couldn't find a Great Grey Owl design -- so we created one! 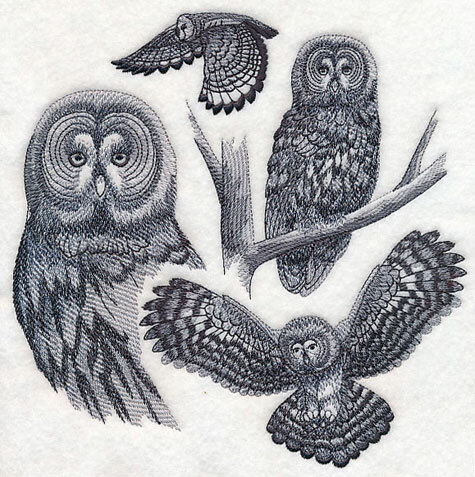 She plans to pair the new design with the Barred Owl, Barn Owl, Horned Owl, and Eagle Owl designs on a throw quilt, but we think it'd be a great addition to any smooth or neutral fabric thanks to the light and open sketch-style. Thanks, Marilyn, for the terrific suggestion! 7.79" x 7.80" and 6.90" x 6.91" and 5.85" x 5.86" and 4.85" x 4.86"